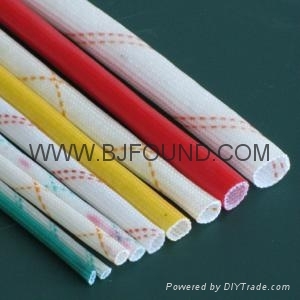 2715 PVC glass fiber sleeving is the non alkali fiberglass braided sleeving coated with polyvinyl chloride resin it is produced with the process of thermo-plasticization. Chemical resistance,excellent softness and elasticity.It can be used for wiring insulation and mechanical protection for electrical machinery,electric appliances, apparatus,wireless, etc. Advantages︰ glass fiber sleeving (pvc sleeving,insulation sleeving) is a kind of electrical insulating varnish sleeve formed by coating alkyd-free glass fiber sleeve with modified PVC resin. 2715 PVC glass fiber sleeving (pvc sleeving,insulation sleeving) is characterized with outstanding features of excellent flexibility,elasticity,dielectric properties and chemical resistance,it is suitable for wiring insulation and machine protection in electric machines,electrical appliances,instruments,radios and other electric devices.